Tulsi vivah is celebrated on the day of Karthik Ekadashi. On this day Tulsi is married to Saaligram. The Tulsi plant is considered as a most sacred plant by the Hindus as it is regarded to be an incarnation of Mahalaxmi who was born as Vrinda. The very name Tulsi, that which cannot be compared, the “incomparable one”, has spiritually uplifting qualities. Tulsi has been found to possess extraordinary powers of healing. Tulsi Vivah is considered the beginning of the wedding season in India in the month of Kartik, which occurs in October/November every year. Tulsi vivah is conducted on the day after Kartik Ekadashi (the eleventh bright day of the new moon, Amavasya). According to Hindu mythology, Tulsi is ceremonially married to Lord Vishnu on this day. The festival continues for five days and concludes on the full moon day. The festival is based on the legend of the marriage (or vivah) of the holy basil plant (or Tulsi) with Lord Vishnu. The tulsi plant is considered holy by many hindus and traditional hindu homes used to have tulsi plant growing in the courtyard. Offerings were made to the tulsi plant every morning and evening during the daily prayers. But how can there be a festival devoted to the marriage of a plant and a God? We have to turn to legend and mythology for an explanation. Tulsi is considered to be an incarnation of Maha Lakshmi, who was born as Vrinda in her previous birth. Vrinda was married to a demon king Jalandhar. But she prayed to Lord Vishnu that her demon husband would be protected, with the result that no God was able to harm him. However on the request of the other gods, Lord Vishnu took the form of Jalandhar and stayed with the unsuspecting Tulsi. When the truth emerged after Jalandhar’s death, Vrinda crused Vishnu and turned him to stone (Shaligram) and collapsed. From her body emerged the tulsi plant. That is why Vishnu pooja is considered incomplete without tulsi leaves.. Since then, every year Tulsi is married to Lord Vishnu and the event is known as Tulsi Shaligram Vivah. It is said that the person who performs the custom of giving away Tulsi to Lord Vishnu, considering her to be his own daughter, is considered to earn the credit of performing kanya-daan. Another legend says that Tulsi came out of the ocean during Amrita manthan as a younger sister of Lakshmi. She was devoted to Lord Vishnu and wanted to marry him but Lakshmi, who was already married to him, did not like the idea and cursed her to become a plant. 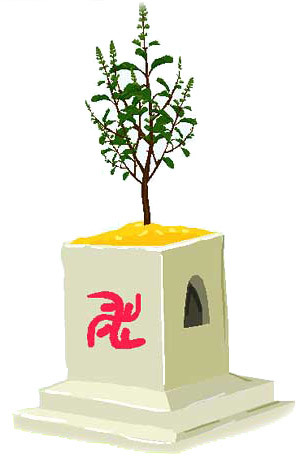 Thus the tulsi plant was born. But the all merciful Lord Vishnu took pity and fulfilling her wish declared that when he will be in the form of a saligram she will remain close to him in the form of a tulsi leaf.